Meals like this are easy as they produce their own sauce with no extra effort. Preheat the oven to 230°C, gas mark 8. Place the pork chops in a large roasting tin. In a small bowl, mix together the garlic, chopped sage, juice from the lemons and oranges, the vinegar and olive oil. Pour over the pork. 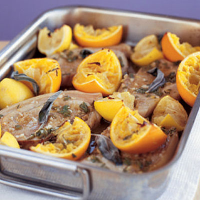 Halve the orange and lemon shells and place them among the pork chops, along with the whole sage leaves. Roast for 15 minutes until the pork is cooked through but still juicy. Remove the pork and place the roasting tin over a high heat and boil until the sauce has reduced to about 6 tbsp. Place the chops on warmed plates with a couple of the lemon and orange quarters (optional), spoon some sauce over the top and scatter with parsley. Serve with Tilda Basmati and Wild Rice.